Random And Some: "What exactly did happen that night on the cliff edge?" "What exactly did happen that night on the cliff edge?" 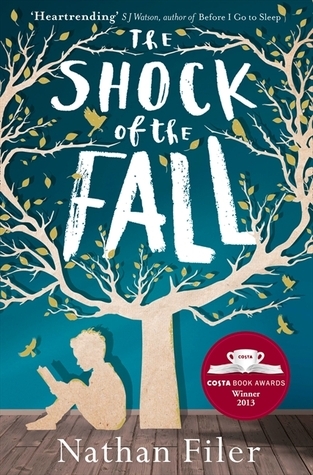 I just finished reading The Shock of the Fall (2013), the debut novel of British writer Nathan Filer. It was one of the UK's best selling titles of 2014 and fell into my lap by way of Tumblr, with a good recommendation by my talented sister Margot sealing the deal. Filer was born in Bristol in 1980 and holds a degree in Mental Health Nursing. He worked in mental health research at the University of Bristol before turning to his pen to advocate about mental illness, mental health nursing and government cuts in mental health services. The Shock of the Fall has been translated into 30 languages. The Shock of the Fall is a portrait of Matthew, a young man with schizophrenia. Describing his life after the tragic death of his older brother, we learn that Matthew blames himself for the occurence. It is not quite clear if he is in fact guilty of his brother's death or if it was just an accident. As Matthew's health suffers under the pressure of guilt, he lives a life that is difficult and strange, and never simple. When his Nana buys him an old typewriter, he decides to put his thoughts to paper, hoping to find some solace and freedom in his scribbles and notes. Offering snapshots of family life, school, friend Jake and life in a mental institution, Matthew's story will pull you in soon enough. Built on a simple, yet clever plot device, Filer with great sympathy and sensitivity paints a beautiful picture about trauma, grief and mental illness. It features plenty of little victories and large setbacks for protagonist Matthew, who I feel will remain with me for a long time. Filer really excels at making you thing about mental illness and the struggles of patients and their families to cope with them. The use of mixed formats illustrates the ebb and flow of Matthew's mental illness. The Shock of the Fall is an extremely honest account of one man's journey through schizophrenia, with great humor and insight to it. Go read this, you will not be disapointed!